Lowest price I've seen for a while on these. 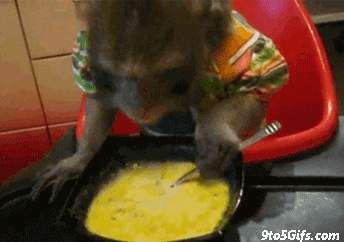 Awesome for porridge as well! Cheers, ordered one. Always wanted. 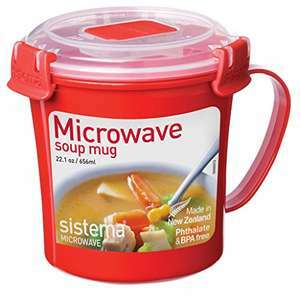 Had one of these for a couple of years, used daily for my soup and its really good. Just make a new account and activate the trial. Its a non issue, you can get prime for 1 month whenever you want. Got mine for 2.1 each as got an extra 5 pounds off for some reason when ordered 10, worked for 8 as well but ended up ordering 10 as such a good deal. Also dishwasher safe. I feel old. Got mine for 2.1 each as got an extra 5 pounds off for some reason when …Got mine for 2.1 each as got an extra 5 pounds off for some reason when ordered 10, worked for 8 as well but ended up ordering 10 as such a good deal. You must love soup to buy that many? I've owned the Sistema, poundland and homebargains ones to give them all a fair comparison and only the Sistema one is the only one still working like the day it was bought. The cheap knock offs are poor fits, warp, don't wash well over time & generally feel cheap & poorly designed. False economy in my opinion, so for this price, heat for the Sistema from me, thanks OP. Only the genuine Sistema is able to withstand the fiery breath of the Soup Dragon (aka microwave). Heat for an excellent price on an excellent product. Can you use this for other things like warming up milk 拏 etc? Same here, takes me to "Gucci Premiere Eau de Parfum Spray for Her 30 ml"
Always considered hukd community to be smart, wouldn't expect this to go that hot. Not voted either way. BTW: Set of 5 glass soup bowls with lid in poundstretcher for 2.99. Bon appetit! Microwaves combined with plastics and boiling water = soup full of plastic …Microwaves combined with plastics and boiling water = soup full of plastic yummies (not just BPAs)... That's why cancer is so "popular" in these days Always considered hukd community to be smart, wouldn't expect this to go that hot. Not voted either way.BTW: Set of 5 glass soup bowls with lid in poundstretcher for 2.99. Bon appetit! Can't tell if you are being serious or not but no, there is no good scientific evidence that there link between plastics & boiling water or microwaves and cancer. There is also no good scientific evidence that BPAs or their replacements (which some suggest are just as bad) can cause cancer either. Finally the suggestion that cancers are many times more prevalent now than X years ago has a lot more to do with the fact that detection methods for cancers have moved on so much and a lot more people are being diagnosed with cancer rather than just for the resulting effects of the cancer. Thanks for this OP, have ordered a couple! +Heat. Had one of these for a while, and it's excellent, plus I don't have cancer. The seal sometimes pops out in the dishwasher, but it's robust enough to take it. Hot deal. Had one of these for a while, and it's excellent, plus I don't have …Had one of these for a while, and it's excellent, plus I don't have cancer. The seal sometimes pops out in the dishwasher, but it's robust enough to take it. Hot deal. The amount of things advertised as dishwasher safe these days, no room for the bl**dy dishes. What is wrong with a £2 soup bowl and cling film with a little steam hole. As these do not keep the soup warm I presume that it is a take to work/education center etc. where you have a micro to do your warming, so keeping your bowl at the place of eating, or with you is just as easy. Or failing this there are plenty of plastic mugs on the market with click and lock type lids, use just need to unclick before microing. What is wrong with a £2 soup bowl and cling film with a little steam hole. …What is wrong with a £2 soup bowl and cling film with a little steam hole. As these do not keep the soup warm I presume that it is a take to work/education center etc. where you have a micro to do your warming, so keeping your bowl at the place of eating, or with you is just as easy. Or failing this there are plenty of plastic mugs on the market with click and lock type lids, use just need to unclick before microing. Can't tell if you are being serious or not but no, there is no good …Can't tell if you are being serious or not but no, there is no good scientific evidence that there link between plastics & boiling water or microwaves and cancer. There is also no good scientific evidence that BPAs or their replacements (which some suggest are just as bad) can cause cancer either. Finally the suggestion that cancers are many times more prevalent now than X years ago has a lot more to do with the fact that detection methods for cancers have moved on so much and a lot more people are being diagnosed with cancer rather than just for the resulting effects of the cancer.Thanks for this OP, have ordered a couple! +Heat. I'm not sure if above meant to be joke or not. Wish you looong healthy life. There might not be enough evidence in human studies, but hundreds of animal studies point to potential health dangers from exposure in the uterus before birth. These include abnormal development of the brain, breast, and prostate. Many animal studies link the chemical to reproductive disorders, including infertility, feminizing of male organs in fetuses, and early puberty in females. A synthetic hormone, BPA mimics estrogen. The plastics chemical family of phthalates also is at the top of researchers’ list of concerns. Like BPA, phthalates are endocrine disruptors, chemicals that can enter the body through food and personal care products and interfere with hormones the body itself produces. Phthalates inhibit androgens and affect males more than females. "BTW: Set of 5 glass soup bowls with lid in poundstretcher for 2.99" - What are the lids made of? Is that lid to share between 5 bowls? Who's a clever boy/girl then?